A growing number of kids do not exercise on a regular basis. Exercise for kids is very important for them to be healthy and not become overweight. Sailing is a great way to exercise and enjoy yourself and that is why many parents take their kids to sailing schools instead of the traditional sports such as football, tennis and rugby. In fact most kids like to be fit and healthy, they just don't like it to be a chore! Also if your child dislikes sport and PE because they are 'difficult' and 'tiring', sailing is a great choice too. This is because you can start of learning how to sail by just sitting there, but eventually they will start moving around in the boat, because they won't see it as exercise! They'll see it as fun! That is the reason I believe many kids dislike normal school PE, because they see it as being a chore instead of something to enjoy and get better at. However, passively they will become fitter from it, because it is a sport and it is exercise. If your child is already an accomplished sailor and wants to improve, it is important to be even fitter so that they can spend more time on the water without being tired and have the strength to pull in the sails on windy days and hike out. Of course they are too young to be lifting weights and doing 5 mile runs everday! However they could watch what they eat (ie: no McDonalds, no milkshakes, etc) and go outside more instead of being inside playing games. In fact the above advise is suitable for all kids, not just those who sail! The fact that the obesity rate for kids and teens in the western world is so high, is because many kids don't go outside and don't eat healthy foods. 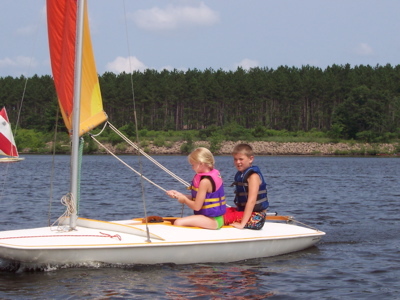 Sailing can take the place of some of the exercise, but it is up to the parent to make sure they eat right and also get some other exercise.